Archery is all about precision. The standard archery contest (in both fiction and real life) involves a marked target, and points based on how close to the center (or bull's eye) the archer can place his arrow. A common dramatic situation is one where The Rival shoots first, and hits the target right in the center. It looks like The Hero has lost the competition, until he shoots his arrow at the opponent's and splits it in half lengthwise. A downplayed version of this is Truth in Television. It's not unusual for hollow-shafted aluminum arrows to "telescope" — one stuck in the end of another. Most archery ranges that have been open any length of time will have some examples mounted on the wall, though it's considered more of a funny fluke than a feat of skill: It doesn't earn you any additional points, and after the first time it's mostly just annoying that your arrows get damaged. However, in order to really count as this trope, the second arrow has to split the first from nock to tip. This normally requires everyone (or at least the first archer) to be using wooden arrowshafts. Traditional arrows often have a horn nock that would deflect the second arrow unless it was removed, and in practice most hardwood arrows don't have such a straight grain that they would reliably split all the way down instead of breaking somewhere in the middle. The second arrow has to be made of something like hollow bamboo and specially prepared in order for the trick to work. In the field, this is known as a shaft shot, sometimes called Robin Hooding, since of course the feat was made famous by you-know-who. This is a subtrope of Improbable Aiming Skills, and a Sister Trope to Shoot the Bullet. Compare to William Telling. One of Dos Equis' beer commercials show their new Most Interesting Man In The World doing this with thrown knives. In Green Arrow #18, bad guy archer Komodo is shown effortlessly doing this during practice to illustrate what a superlative archer he is. Robyn does this in Grimm Fairy Tales Presents: Robyn Hood #7 while she is practicing so she does not become overly reliant on her magical bow Scarlet. Wonder Woman: Artemis, goddess of the hunt, has been seen shooting an arrow at a target, and then splitting it with the subsequent shot while plotting with her brother Apollo. Prince Valiant (Jan. 6-13, 2013) takes it over the top, with the challenger splitting every one of her opponent's arrows, no matter where on the target they are. Making an impression is apparently more important than winning the tournament, or else she would consider aiming for the center of the bulls-eye. The Wizard of Id: In one strip, Sir Rodney puts an arrow in the bulls-eye during a tournament. The King asks him if he can do it again. Rodney responds by splitting the arrow. When the King congratulates him, Rodney mutters that he had been aiming at the apple in the King's hand. Disney's Robin Hood has the title character shoot one of his own arrows mid-flight to change its course, resulting in it hitting dead center and splitting the sheriff's arrow. In Brave, this is how Merida wins the archery contest to avoid an Arranged Marriage. Not only does her arrow split the other arrow, but it also goes straight through the target and hits the stand behind it! 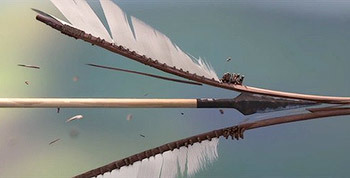 In Kubo and the Two Strings, Beetle shows off his skills by splitting an arrow, then splitting the splitting arrow, then splitting the splitter splitting arrow, then splitting the splitter-splitting splitting arrow in rapid succession. This is foreshadowing that he is Hanzo, who Kubo's mother noted was an incredible archer. The Trope Codifier is the 1938 version of The Adventures of Robin Hood. In the 1952 The Storyof Robin Hood And His Merrie Men, Robin and his father, Hugh Fitzooth, compete against one of the Sheriff's men. First the Sheriff's man tries, and is short of the mark. Then Robin beats him with a perfect bulls-eye, and then Hugh Fitzooth splits his arrow. Subverted in that, though he is offered the prize, Hugh gives it to his son, whose aim "was no less true than mine." Played with in the archery contest scene, where Lucky Luca does this to Robin's arrow. Robin's Patriot Arrow flies wildly around, before slamming into the target utterly destroying the other arrows. Robin's daughter Gwyn does this in Princess of Thieves; splitting the arrow at 100 yards to win the tournament. In the second book of the Sword of Truth series, Kahlan mentions her Home Guard gives ribbons for such shots (called shaft shots). A few had half a dozen ribbons, one had ten. She herself manages such a shot after some training by Richard... who, due to his magical powers awakening, ruined a hundred arrows in a single session. The Time Wars novel The Ivanhoe Gambit has a scene where one of the time-traveling heroes, standing in for Robin Hood, pulls off this feat using a high-tech arrow with a built-in guidance computer. Both Alfred and the villain known as The Archer did this in Batman. In fact, they were both so good that they agreed that the first one to fail to split the other's arrow would lose. The MythBusters took on the Errol Flynn scene twice, and busted it both times. They suspect the arrow Flynn (or archery adviser Howard Hill) shot at had been tampered with — their guest archer pulled the split off on the first try when shooting at a hollow bamboo arrow. The Doctor Who episode "Robots of Sherwood" takes this Up to Eleven when Robin Hood and the Doctor keep splitting one another's arrows in the famous archery contest. Though the Doctor later confesses to cheating with homing arrows. Mission: Impossible: In "The Golden Serpent (Part 1)", the Bodyguard Babe of one of the villains is shown doing this while practicing with her pistol crossbow; to show how deadly she is. In Once Upon a Time "The Bear and the Bow," Merida does this several times in succession. When Things Were Rotten: In "The Capture of Robin Hood", it is the Sheriff of Nottingham who splits the arrow during the archery competition. Robin Hood bests by shooting an arrow that curves around the target and knocks out the Sheriff's arrow by coming through the back of the target. "The Virtue Affair" contains a contest of escalating trick archery, including splitting an arrow. In "The Gazebo in the Maze Affair," Napoleon does this with darts in a British pub. Discussed in an episode of in the Danish series, Hjerteafdelingen (The Cardiology Ward). The doctors have arranged for a wise Indian guru to visit the patients in order to give them life advice and answer their innermost questions. One of the patients asks the guru about the classic Robin Hood example (he had recently read the story), questioning exactly why doing this stunt allowed Robin to win the shooting contest. The guru ruminates over the question for a long time and but is unable to come up with an answer, something that frustrates him so much that he eventually suffers a heart attack from the stress of it. When Robin of Sherwood did this scene, everyone assumes Robin has won, until the Sheriff snarkily observes that both arrows hit the bullseye, so there needs to be a tie-breaker. The Trope Maker is Robin Hood. While participating in the finals of an archery contest, Robin Hood's opponent (typically the Sheriff of Nottingham, but there have been others) shoots an arrow into the dead center of the bullseye. Not to be outdone, Robin Hood fires his own arrow, and splits his opponent's arrow in half down the middle. Most people will be most familiar with the scene from Errol Flynn's The Adventures of Robin Hood, but the story has been traced back to the 17th-century ballad "Robin Hood and Queen Catherin". It became a popular part of the legend when Walter Scott used it in Ivanhoe. GURPS: Robin Hood includes Robin Hood style characters for different settings. The Wild West version is a White Man Gone Native whose native name 'Splits Arrow' comes from performing this feat. In Overwatch, one of Hanzo's highlight openings shows him not only doing this, but splitting the entire target as well. In the Dragons Cinematic. Genji slices an arrow heading for him shot by Hanzo using his sword and the splitted arrow sticks on a wall. Gunnerkrigg Court had Janet and Willy doing this "fancy shooting", resulting in a draw on the last shot of a competition. It looks like they cooperated and rehearsed this "accident", of course. Played for Laughs in Fluke by Glennz. In the Volume 3 finale of RWBY, Pyrrha throws her shield Akoúo at Cinder's arrow to stop it, since Cinder had destroyed her regular weapon, Miló. The arrow splits, but then reforms and keeps going once the shield has passed. This proves to be the end of the line for poor Pyrrha. Avatar: The Last Airbender: Near the beginning of "The Blue Spirit" episode, the Yu-Yan Archers are shown at a firing range. One of them splits an arrow, then splits that arrow, and finally the third arrow in succession, so each is embedded in the other. An episode of Dave the Barbarian has Dave's girlfriend for the episode doing this during their Falling-in-Love Montage, at which point they're doing underwater archery. The opening credits of Robin Hood Daffy have an arrow flying into the center of a target, followed by a series of arrows each flying into the end of the one before it. The camera pulls back to reveal that Daffy is shooting each arrow from less than an inch away.